In the subterranean garage at work sits a lonely bike. A poor Reid hybrid. 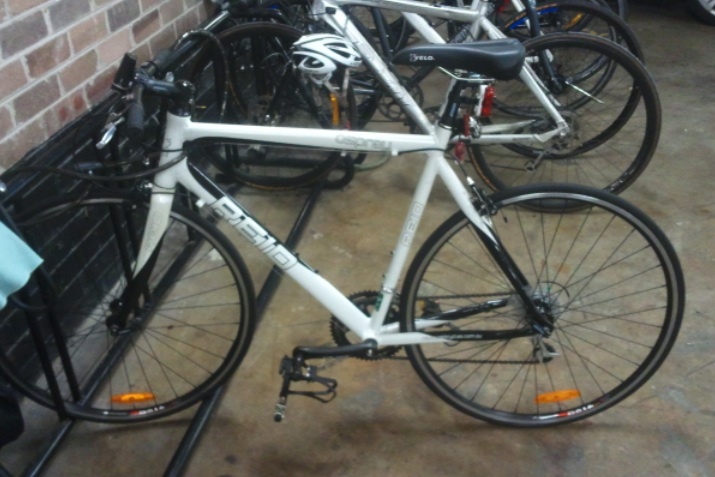 Nice Aussie bike, well set up with flat bars – perfect for commuting. It’s actually a bit of a pain, as it’s front-wheel into the rack, which means it tends to fall over when knocked. It’s been there for over six months now. Never moved. Has it been abandoned? I wonder who the owner is, and why they gave up on it. How are they getting to work? Since we moved house in December, my commute now takes me across Iron Cove Bridge. Depending on how I’m feeling, I can either take the back streets, ride around the Bay Run, or scoot straight down Victoria Road from Drummoyne. The latter is the fastest, so it’s what I do in the morning if I’m running a bit late. It’s super easy; there’s a bus lane all the way, so I just fly along. Of course, there are a few buses, but usually I can squeeze past them at the bus stops, so they don’t hold me up much. But what is truly extraordinary are the lanes devoted to cars. Three or four pretty much stationary lines of vehicles all the way from Drummoyne to Anzac Bridge (and frequently across the bridge too). One day I am going to count the number of cars I go past on the way to work. It must be hundreds. I’m tempted to say thousands, but one other astonishing thing about these jams is just how few cars there actually are. It’s a distance of about three kilometres, so if each car takes up ten metres of road, that’s about 300 cars per lane – say 900 in total. Each car only has one person in it, so that’s less than one thousand people sitting there, clogging up a huge amount of road. I’m in awe of these people. They sit there patiently for hours in the morning, day after day. Jeez, I would go crazy if I had to do that. As it is, I’m past them all in less then ten minutes, whereas it must take them the best part of an hour to cover the same distance. Maybe I should tell one of them about the orphaned bike in our work garage. Perhaps they could make the owner an offer, and get the poor thing out in the sunshine again – and save themselves a couple of hours a day in commuting time.